The Tustin Area Council for Fine Arts gave us a "Thank You" on for helping with this year's Broadway in the Park performance. We would like to thank the TACFA for allowing us to do our part for their annual community performance event. The simple donation of a truck and moving crew to get their props and equipment from storage to their temporary stage allows us to be a part of this delightful annual event that uplifts the community through supporting the arts. This year's performance of Disney's The Little Mermaid, August 7-11, will be enjoyed by children and adults alike. As part of their mission to develop, showcase and support the arts in the community, the Tustin Area Council for Fine Arts' Broadway in the Park program, puts on quality performances by professional casts. The summer programs are catered to families through musicals everyone can enjoy with low-cost tickets. 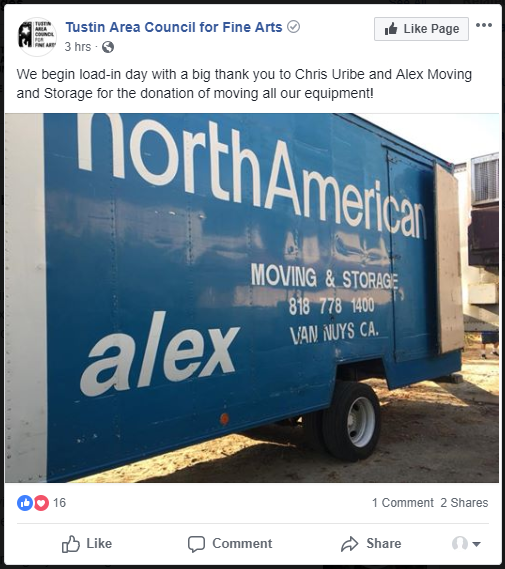 At Alex Moving & Storage, we take pride in being a part of the community and supporting local organizations. We are glad to do our part in helping the week-long event run smoothly and on time. A big "Thank you" goes out to the TACFA for helping to enrich the lives of those in our community - and to the Broadway in the Park program creators and players for the wonderful performances each year!